No card today as I've been working on other things but I visited my old Funky Fairy team-mate Han to keep up with what's happening and she has candy to celebrate 20,000 hits on her blog which goes to show how great it is: Congratulations Han! And the very talented Lim has great candy on her blog here. Both great blogs to visit without any other excuse! This was done in such a rush! An hour before leaving for a farewell 'do' I still hadn't finished his card. Jonathan's girlfriend is moving back to Australia with her family after being in France 3 years and he is going with her! Therefore an Aussie themed card. I had this paper from Pink Petticoat printed, waiting to get used for the Arty Girlz 'Autumn' challenge so this was the card - All done in Autumn colours and my husband photographed it while I was getting ready to go! The koalas were water-coloured with pencils and layered 3D and I doodled round them and the sentiment to pull together what I felt were two different styles of stamp. Hope that works: It was well received, which is the main thing! Big thanks first of all for comments left last few days, really put a smile on my face to hear from you ! Making most of last bit of summer and going cycling today, with a nice lunch stop. This card is for a challenge Claudia set. I follow her blog and love her cards. Also hopped on to lots of other entries with fab cards yesterday: Great talent out there! 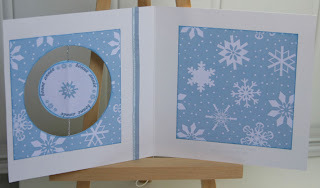 I used my Kerudoc Création Winter CD papers with cuttlebug snowflakes and Whiff of Joy image sent by Jessi (thanks again) coloured with Distress inks and a touch of my DoCraft markers and Sakura glaze. Merci de vos commentaires: Ils me font sourire! Cette carte est pour le 'sketch' challenge de Claudia - son blog et ses cartes est très joli. J'ai imprimé à utiliser mes dessins du CD 'Hiver' de Kerudoc Création avec flocon découpe sur le Cuttlebug, tampon de Whiff of Joy, peinture avec Distress inks et des autres. The glass is definitely half full ! Wierd few days, still not on top form but really great in other ways! Good news is I have won a sample from ShortCuts of clear & frosted cards which I can't wait to get, and this fab candy arrived from Jessi which was a BIG cheer-up! Big thank you Jessi! 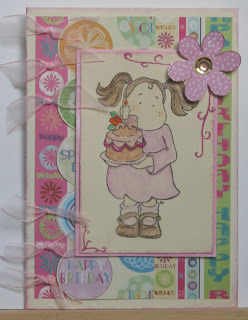 Can't wait to play with that stamp and just love the images she sent with it, plus her gorgeous card. Also, I was paid for 33 cards this morning with an order for another 20, and have a confirmed place at the Artisan'Arts Marché de Noël at Châteaulin on 22-23rd Nov : Both big incentives to make LOTS of cards and other bits! Je suis très content à gagne le tombola de ShortCuts (des 'clear' cartes) et ce 'candy' qui est arrivé de Jessi aujourd'hui. Alors, j'ai vendu 33 cartes et j'ai reçu un commande de 20 plus, et je participerai à la Marché de Noël de Artisan'Arts à Châteaulin le 22 & 23 novembre: Plus de cartes et scrap! Few cards made yesterday: This one was made with the Cartes Maniak challenge #65 and also Nessy's blog candy challenge in mind and I followed the Ismaki sketch at the same time! 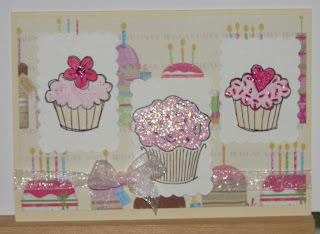 Well after baking, I mean colouring and glittering, these cakes yesterday I have not been well today and only managed to throw them on to the card before the Cute Card Thursday challenge expires. Actually, if you saw how I ice cakes, that's par for the course! 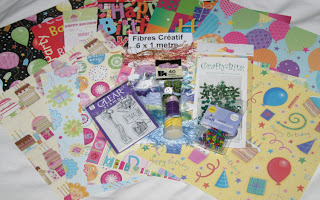 Arty Girlz challenge blog is a year old so the challenge this week was Birthdays! Here is my card to wish them a happy birthday! And big thanks to Sam for my PIF images (using the first here) - there'll be a PIF from me as soon as I find time for some more stamping! 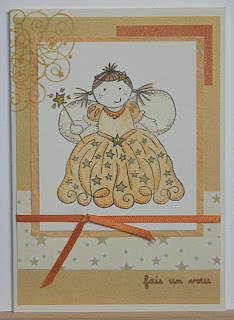 Ma carte pour le challenge de blog Arty Girlz: C'est son premier anniversaire! Here's my last minute card for this week's Kaboodle Doodle challenge: to use torn paper. 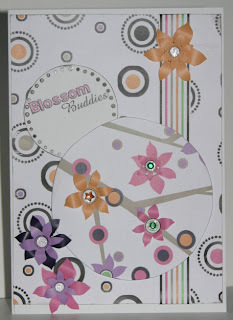 I've used Kaboodle Doodle's free download from week 1 with a Pink Petticoat image and the Cuttlebug 'Bloom Dots' embossing. Ma carte pour le challenge Kaboodle Doodle - à utiliser des papier déchira. 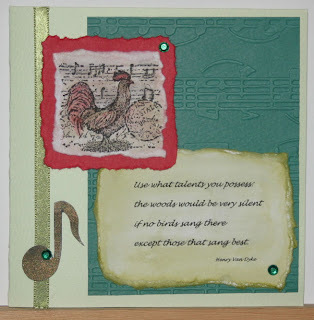 I didn't intend to do 2 challenges in one but the ideas floated around until these came out: Sunday Stampers current challenge is 'Alphabet Street' and the Tag you're It! challenge ending today was 'monochrome'. 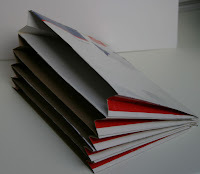 I did the blue version first but wasn't entirely happy with it and decided at over 20cm/8" it was a bit long for an average book so I did the red one which is 16cm/6" and I glazed 'Lire' being the French 'to read'. 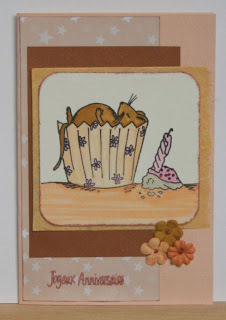 Used: Cuttlebug 'Script' embossing folder, Brilliance inks, SU! grosgrain ribbon, SeeDs alphabets (whimsy, plain jane & large swirl), Making Memories brad. 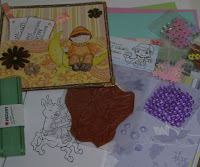 J'ai creé 2 marque-page pour les challenges de Sunday Stampers 'Alphabet' et de Tag you're It! 'monochrome'. J'ai utiliseé le Cuttlebug classeur de gaufrage 'Script', encre Brilliance, ruban de SU!, Tampons alphabets de SeeDs et attachés parisienne de Making Memories. Dans ma Maison il y a... un chat ! Ma maison pour le challenge : Une marque-page. C’est ma première fois pour ce challenge et une longe temps depuis j’ai créé un marque-page : Voila ! ‘Dans ma maison’ is a wonderful mixed media blog which I’ve stalked for a while so I’ve finally taken the plunge and joined in this week’s cat theme with my house-shaped bookmark. on or in your card somewhere: I went for up front and obvious! Actually was going to use the Cuttlebug Bird Call embossing folder until I fell over this Stamping Up stamp and realised the cockerel had music behind him. Made the rest up as I went along! Ma carte pour le challenge de Daring Cardmakers : à utiliser le quotation. I used / J'ai utilisé : Stamping Up 'Provençal', Cuttlebug 'Allegro', Distress Inks. so that's ... Michele ! Here's some candy offered to celebrate 5000 hits although I'm well past that now! The last month or more has gone too fast and I'm determined to get back on track, including doing more challenges and more blogging. I really appreciate my visitors, and especially those who leave a comment. Thank you ! Encore de sketch - Another card sketch ! Voici ma carte pour le sketch #16 du blog de Sandrine. 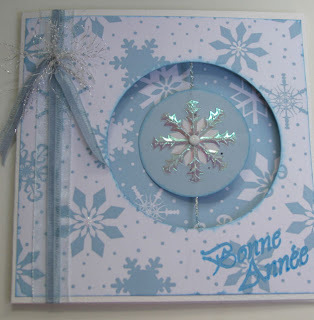 J'ai utilisé mes même papiers de Kerudoc Création 'Hiver' CD au-dessous. 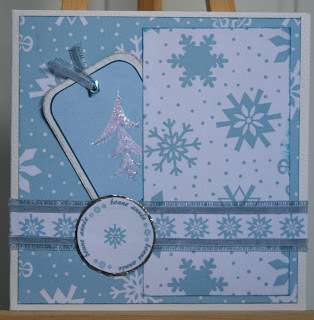 From sketch 16 on Sandrine's blog, another card using the same Kerudoc Creation Winter papers as below (and a milk bottle top, washed first!). Voici ma carte à suivre le sketch avec un panneau qui tourne de l’Ismaki challenge #30. J’ai utilisé des papiers et étiquettes j’ai imprimé de Kerudoc Création ‘Hiver’ CD. 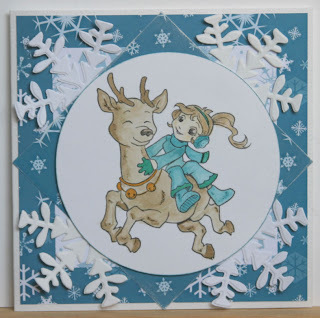 My card for the sketch with a swiveling part for Ismaki challenge 30 using papers from my Kerudoc Création Winter CD. 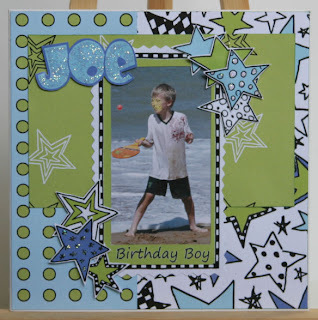 The sister blog to Sheetload of cards, 'Sheetload' is giving away a sample of the fabby new clear and frosted cards they are about to launch and they look great - the example cards are well worth a look for clear card ideas. Have to be quick if you want to win the sample though - it finishes tonight! I've combined the great sketch #18 on Friday sketchers with the Kaboodle Doodle challenge #2 of 'Feeling Spotty' on this card. 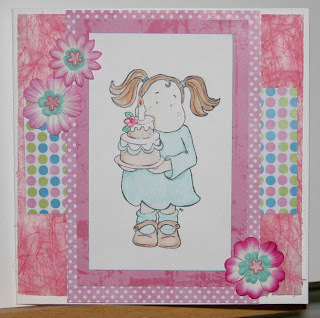 Andrea at Kaboodle Doodle was kind enough to give everyone who entered last week's challenge a free download so I chose 'Berry Blossom Bright' and have used that for this week's card. Thanks Andrea! Unfortunately the flash has made too much of the bling and the white space: Better in the flesh I think! Ma carte pour la challenge du 'Friday Sketchers' #18 et aussi de la challenge #2 du 'Kaboodle Doodle': 'Spotty'. J'ai utlisé des papiers et texte de Kaboodle Doodle. Malheureusement la photo n'est pas bien (la lumière étais trop fort). Suzanne is the latest in Whiff of Joy's DT to offer candy and it is gorgeous! Go check it out! And have you seen the sets Bine is offering! Arty Girlz challenge - Alter It! Seem to be behind with everything still but the Arty Girlz challenge ending today (!) was 'Alter It!' and I had in mind to use these US postal envelopes to make an expanding file: Got to find some way to get organised!!! So set off by cutting them in half, scoring in at about 2cm each side and cutting the bottom corners off at an angle so I could fold them in for the 'expanding' part: Stuck 5 of these half-envelopes together and then set about covering them. I used 2 pieces of docrafts 12"x12" paper and measured the front with a flap + gusset underneath, concertina sides and a flap over the top edge: I did the back similarly but without the underneath part, some extra concertina bits to finish the sides, then some extra pieces over the tops of the inner bits to neaten where the envelopes join. 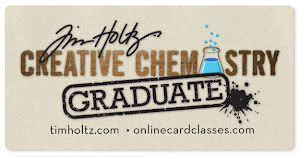 I was determined to get a card done as I haven’t felt like my head is connected to my body lately and ended up on thyroid tablets last week, as well as already being on blood pressure tablets, and you have to take both for life once you start, so I am feeling well over my 45 years!!! So, it’ back in the saddle then! 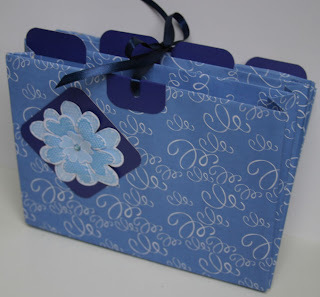 Used: Magnolia image water-coloured and part-glazed, Dovecraft papers and stash bits! Candy, and with a message! Candy at: Carmen's Ecke for 20000 hits !!! at Karin - scrap everything for 10000 hits in just 5 months ! and at Jessis Kreativblog for 10000 hits since January! 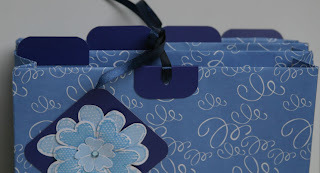 Also check out Irena's blog she has candy and stunning projects on there. All these are not only generous but ab fab blogs too! Really recommend a visit!